Chorus York & Artistic Director Stéphane Potvin invite you to “Classics in the Spring”, a program of classical choral repertoire. The concert will feature Vivald’s “Gloria” with guest soloists Angela Gibbon and Kira Braun , along with works by Tallis, Farrant, & Byrd. 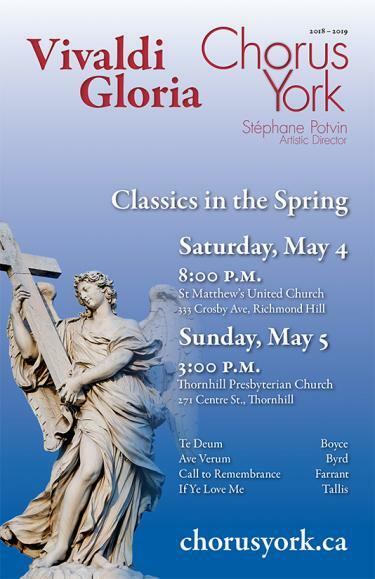 Chorus York & Artistic Director Stéphane Potvin invite you to “Classics in the Spring”, a program of classical choral repertoire. The concert will feature Vivald’s “Gloria” with guest soloists Angela Gibbon & Kira Braun, and works by Tallis, Farrant & Byrd. There will be a reception after the concert where you can meet our director & mingle with the choir.